THE AUTHOR: Gary D. Wilson. THE PUBLISHER: Roundfire Books at John Hunt Publishing. They are based near London in the UK and have been in business since, I believe, 1999. I ran across them in a Deuotrope listing. SUMMARY: Suppose your more than mildly irritating leech of a sister calls you, as she usually does wanting money, only this time she says instead that she has cancer and in the course of the conversation challenges you to write the story of her life. You say, sure, you’ll do that but you’ll tell it the way you see it. The tale that emerges involves not only the dying sister, Connie, but brother Len as well. And it’s also about “me,” the sibling invited to narrate their shared story and whose interplay of memory and imagination raises the question of whether “the truth” of Connie’s life – or of anyone’s for that matter – can ever be known. THE BACK STORY: The story grew from when I visited my sister in the hospital and saw the PICC line in her arm. The skin was puckered around the insertion point of the line. It was like a little mouth sucking, and I couldn’t get the image out of my mind, even after I’d come home. It was keeping me from getting anything else done, so I thought maybe if I wrote it out of my system I could get on with my life. I wrote what came to be the first section of Getting Right, and I found I couldn’t stop. The story kept coming and coming and I became more captivated by the momentum of the piece and its primary diving force, the narrative voice. WHY THIS TITLE? : Titles either come to me right away, or they can take months to appear. I had several working titles for this novel but none that I really liked. Then one evening, as I was reading a scene aloud to my wife, she stopped me and said, “There, that’s it. Getting Right.” And she was right. WHY WOULD SOMEONE WANT TO READ IT? Getting Right is a literary novel, but that doesn’t necessarily mean it is difficult or distant. Just the opposite seems to be true from the reactions I’ve gotten to it. Even though the story is episodic and doesn’t follow a traditional narrative arc, people do respond to it—and almost always in a positive manner. One reader said what amazed her was how everyone she talked with could find themselves in the writing and could without fail identify their own family in the one depicted in the novel. So there seems to be both universal and personal appeal to the book. AUTHOR PROFILE: I fell in love with language because of my high school English teacher, who read Shakespeare aloud to our class. I wrote a few things during that time of my life, but they were just awful. I knew that even then, but the process of putting words on a blank page intrigued me to no end. I continued creating doggerel through college and into graduate school. Then I went to Peace Corps and while there read and read and wrote and wrote, and things got better. I thought, why not? So instead of pursuing an academic career, I got an MFA and have been teaching writing and writing myself ever since. Thank you, Mrs. Nettleton. Over the years, I have been fortunate enough to have published two novels, Sing, Ronnie Blue in 2007, and now Getting Right. My short fiction has appeared in dozens of literary magazines across the country. I am a lucky person. AUTHOR COMMENTS: I have a keen interest in how stories are told. 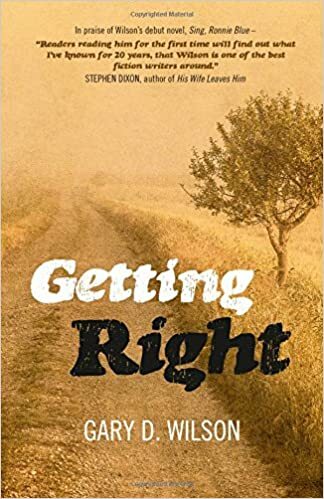 In Getting Right, I was faced with how to approach topics such as death and dying and strained relationships in a way that would make the narrative not only approachable but attractive to a reader. What came out of the effort was a strong narrative voice and an close examination of where memory and imagination intersect. I’m pleased with the results. SAMPLE CHAPTER: A sample is available on Getting Right’s Amazon page. LOCAL OUTLETS: Support your local bookseller. They can order my novel from National Book Network, the US distributor for Roundfire Books and other John Hunt Publishing imprints. WHERE ELSE TO BUY IT: Amazon, Barnes & noble, etc. Amazon, Barnes & Noble, Sony, iTunes. Also try Abe Books for a listing of international book sellers who stock Getting Right. PRICE: $16.95 print; $7.99 e-book. CONTACT THE AUTHOR: I would love to hear from anyone regarding my work or writing in general. My email address is gary.wilson0@gmail.com I also invite people to go to my website: http://www.garydwilson.com I have a blog there that might be of interest, especially if you’ve read Getting Right. Irony is not dead.